There's a whole segment of tabletop games dedicated to puzzle games. The vast majority of them are single-player games with a few which are 2-player games. It's a little rare to encounter a puzzle game that supports more players and finds a way to be competitive. Enter Fold-It, a clever yet highly enjoyable game with a very unique game mechanic. And as diverse as games can be, I was not prepared for a cooking-themed competitive folding game to be so enjoyable. In our efforts to play with different groups, most folks enjoy the challenge but maybe half can't immediately wrap their heads around how to fold the cloth to fulfill the order. But everyone tries their best to get through the experience and play to the end at least. 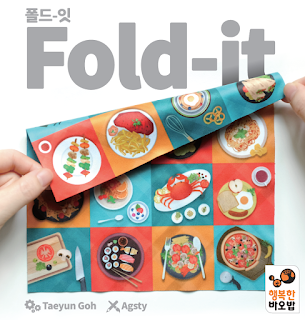 Fold-It is a folding-based cooking game designed by Yohan Goh. The game supports 2-5 players but the box contains an extra folding cloth just in case. Players are in a race to fulfill the orders printed on the order cards - one deck of basic orders and one deck of advanced orders. An order consists of the image of 1-4 dishes that can also be found on the recipe cloth they each have. The cloth has 16 different dishes in a 4x4 grid and has the same dishes printed on the other side in reverse so there's consistency between the two sides. The main limitations are that the cloth can only be folded along the grid formed by the different pictures, so there can be no diagonal folds or half folkds that break across the other dishes. You keep folding until only the dishes on the order card are visible and then you take one of the wooden tokens on the table. There are only enough tokens for all but one of the players so the last player is left without a token and must give up one of their three stars. When a player runs out of stars they're out of the game and the rest continue playing until only one player is left. What I Like: The folding game mechanic is oddly brilliant and it ends up combining the same principles of origami with a game. Thus it leans heavily on spatial reasoning to figure out the solutions. Over time you'll understand the general approach to how to fold the cloth to get to where you need to be and the advanced cards are sure to provide a more fulfilling challenge. But as the game is still competitive there are many ways to play this. Even the more experienced players can still use the basic order cards in order to challenge fellow players based on speed instead of just skill and reasoning. So on the whole there are still a few strategies one might try to employ in order to win the game. I rather enjoyed the decision to go with a cloth for the recipes instead of something more like paper since it better ensures longevity for the game. The wooden tokens are also of a brilliant design as they semi-circle shape helps make them easily clutched by hurried players. What Could Have Been Better: As far as components go, the starts were an odd part of the game and I kind of wish that there had been a better approach for tracking each player's "life" in the game. They're just cardboard circles and it seems like an odd note given how everything else was clever and rather beautiful even. And this is all contained in a box that is obviously more for getting attention on the shelf than practical storage of all components as it's pretty big for a game with limited pieces. There are a few alternate modes of play but the variation isn't all that great. The way this is played is pretty specific across games and you will encounter people who just won't get it and it can get rather frustrating for them. So the game can be a bit hit or miss at times when it comes to other players who haven't tried it before. 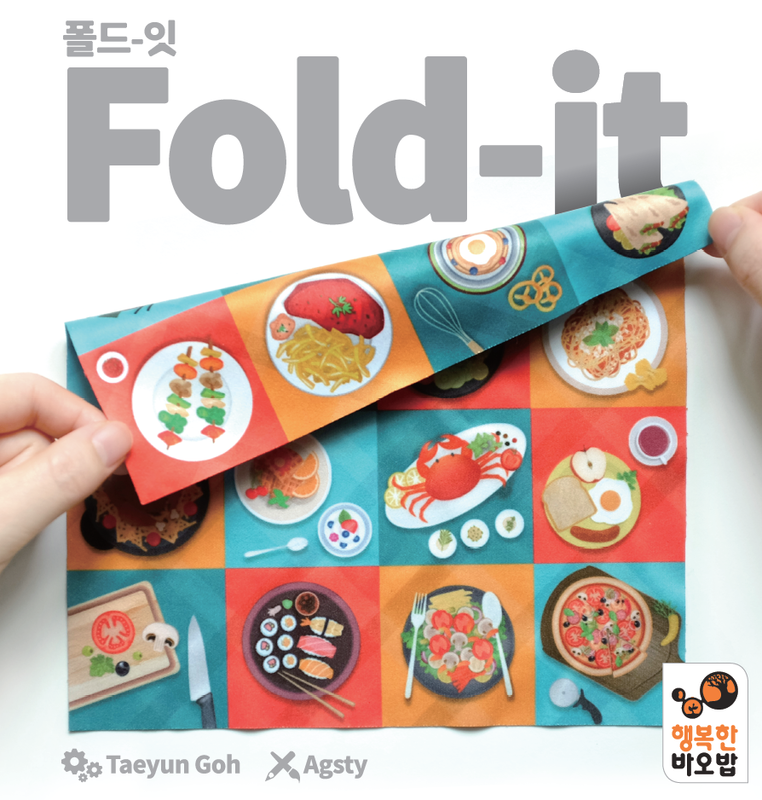 TL;DR: Fold-It is still a nicely clever game that plays pretty quickly and can be a lot of fun. It's not the sort of game that you'll play throughout the entire game night but it does make for a nice transition game between other games. And thus it gets a good 4 clever, unorthodox folding sequences out of a possible 5.